Ascending Butterfly: I can finally fuel my designer #handbag obsession & get great prices, seriously folks there is #MoreatSears than meets the eye! I can finally fuel my designer #handbag obsession & get great prices, seriously folks there is #MoreatSears than meets the eye! It's no surprise to long time followers that I have a handbag obsession. I will never own enough handbags. If there were a support group, I'd be it's President. Since 2009 we have featured a 'Featured Monthly Handbag in the Spotlight' on Ascending Butterfly, it's included both established and emerging brands /designers and probably just about every color of handbag under the sun. Remember how I was telling you yesterday that the blogging Gods & the Universe have been sending me all kinds of signals? When this info hit my email inbox I have to admit it made me laugh. Not in a bad way, just in a not surprised way because I actually inadvertently discovered this revelation on my own, and I'm more than happy to let you guys in on the secret. 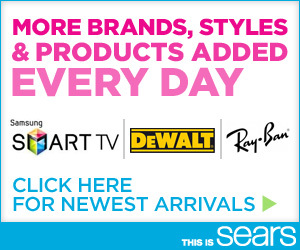 Check out the Newest Arrivals at Sears Market Place! Screen Capture of Sears.com Front Loader Washers - New Arrivals! 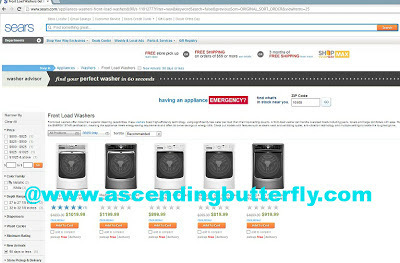 I don't know about you, but this mercury retrograde has been wreaking havoc on my appliances and electronics so I am researching a few major purchases (for after the retrograde dust clears of course) including a new Washer/Dryer, Refrigerator, and hoping somewhere in there I can squeeze in that handbag I'm lusting after, before it totally sells out! What will YOU buy at Sears.com today? FTC Disclosure: This is a Sponsored Post written by Ascending Butterfly on behalf of Sears via the Niche Mommy Network & Conference, however all opinions expressed herein are 100% my own. See our Full Disclosure Policy for additional information. My mother loved to shop at sears( bought her first color tv there) so when I started my home I shopped there as well, but lately not so much.Good to know they've expanded their product line and that they now even give $ incentive if items aren't in store on time. Time to take a second look at Sears.com.